Gene Okerlund, who was a crucial part of WWF’s 1980s national expansion as its backstage interviewer, has died. He passed away of undisclosed causes at the age of 76, according to WWE. Born in South Dakota in 1942, Okerlund transitioned from radio and TV into the wrestling business in 1970, when he started working for Verne Gagne’s AWA out of Minneapolis. During his 14 years with the AWA Okerlund would first work with later WWF colleagues like Hulk Hogan, Bobby Heenan and Jesse “The Body” Ventura. In 1984 Okerlund moved to the WWF during a mass raid on AWA at the start of the Hulkamania era. As WWF’s main backstage interviewer, Okerlund would be a vital part of some of the greatest promos in wrestling history as a straight man for stars like Hogan and “Macho Man” Randy Savage. He’s as iconic a figure from that era of WWF as Hogan himself. Okerlund also worked for WCW throughout the 1990s, appearing regularly on Monday Nitro when it was the most watched wrestling show on TV and hosting the company’s 900 number paid hotline. After WWF bought WCW in 2001, he appeared on various WWF and WWE TV shows, often discussing the past and history of the wrestling business. Okerlund defined the platonic ideal of the wrestling interviewer for multiple generations of wrestling fans. He was a serious, professional presence (always in a suit) whose reactions to the often cartoonish characters and humor of pro wrestling helped ground the fake sport during some of its most ridiculous eras. Okerlund wasn’t unflappable—his flappability was one of his most important traits in getting wrestlers and promos over—but he always felt like a real broadcaster who was reacting to these absurd situations in a real and human way. He was, in many ways, a POV character for the pro wrestling audience. Nobody since has done his job nearly as well as he did. 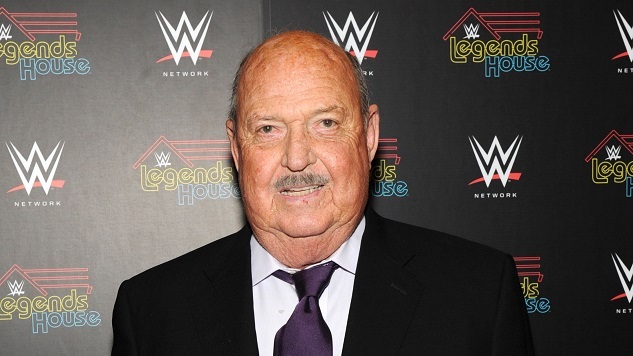 Okerlund lived in Sarasota, Fla. for decades and is survived by his wife Jeanne and their son Todd.